The global process of remodeling and reforming a New World on Planet Earth, the G-d of Israel is igniting the infernal in the central magnetic core in the center of the earth. With the rise of the erupting plumes of magma from the center of the earth, we today are witnessing an amazing transformation that is transforming our earth from its post-diluvian continents balanced around the globe into a future New Gan Eden (Garden of Eden) in our future. 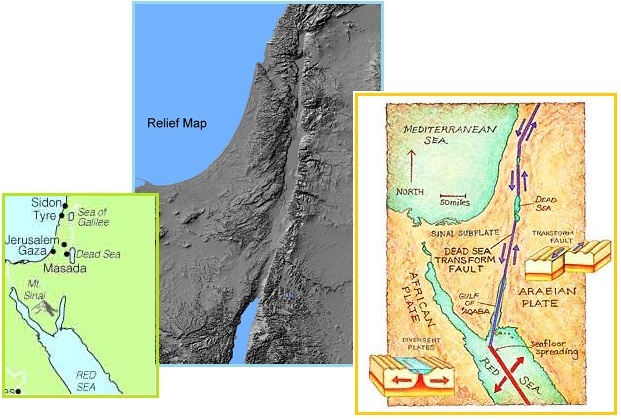 The ancient work of volcanism is readily envisioned just by looking at a relief map of Israel and see how its alignment with the tectonic plate borders between the Arabian and the African plates is clearly outlined through the Dead Sea up the Jordan River Valley to the north. This delineates the origins of the Dead Sea and the Sea of Galilee to the north with their alignment with the regions to the south that include today the widening of the Red Sea and the Gulf of Ancient Aqaba to the south where the Children of Israel fleeing from Egypt during the Great Exodus, crossed as the Sea of Reeds in route to the real Mount Sinai called Mount Horeb in northwestern Saudi Arabia today. With the north and south lateral tectonic plate shifting of the Arabian and the African Plate, and with the widening of the Red Sea to the south, it is speculated by earth change scientists that and the movement of the Arabian Plate to the east will rip the Sinai Peninsula away from the Arabian deserts now controlled by Saudi Arabia by as much as 50 miles and during the last catastrophic era before the era of the future Jewish Messiah begins. According to the Jewish rabbinic prophecy of Rabbi Jacob ben Samuel in 1217 CE, the day may be only three years into our future on Rosh Hashanah 2016, the Hebrew Jubilee Year of 5777 (2017). These earth changes also may widen the Straits of Gibraltar by as much as 125 miles when the African Plate drops to the south, and the Islamic Nation of Morocco on the Northern Mediterranean and the Atlantic coastlines will be pulled 50 miles to the east. Also to the east the Sinai Peninsula that is considered a part of the African Plate may be ripped apart from its attachment to the Islamic regions of the Saudi Arabia to the east as the Gulf of Aqaba at that time will be severed from its eastern Jordanian shoreline. With these catastrophic changes, the tectonic plate borders between the Arabian and African plates are clearly delineated in the maps below as they migrate north through the Dead Sea towards the Sea of Galilee, it would not be surprising that the roll of the African Plate did not catastrophically change this entire region controlled predominately by the Islamic nations to the west and south of Jerusalem. The scars from past tectonic slips today show up dramatically on the landscape reliefs seen below. The future tectonic changes envisioned by the Hebrew prophets of old, foretold of these apocalyptic changes that will cascade through and engulf this whole region. They foretold that the “Acts of the G-d of Israel” will indelibly leave the imprint of the finger of the Divine written all over the landscape of our prophetic future. When it is over, the Sinai Peninsula that is considered a part of the African Plate off the eastern coastline Africa may be dangling almost on its own like an island with very few land attached to Egypt in the west. The Sinai region is today the evidence of the remnant balsaltic layers of massive volcanism that occurred during volcanic eruptions that covered the whole Sinai Peninsula all the way back north to the Island of Santorini in the Mediterranean to the north. It was there that the Stroggili Volcano on Thera exploded and also sank and destroyed the ancient Minoan culture with volcanic magma that some claim was the ancient island of Atlantis. All this was occurring while the Children of Israel were watching with fear and amazement during a volcanic eruption at Mount Horeb to the east in Arabia when HaShem, the G-d of Israel gave to them His Torah and instituted them as the Nation of Israel about 3,600 years ago in the mid-16th century BCE. This same remodeling of the continental plates around the world was also envisioned not only in the rise of earthquakes but in the eruptions of volcanoes that have been witnessed over the past 17 decades, since the era of 1840-1850. Is this important and what could be the meaning of this dramatic and steady increase over the past 160 years? Could the G-d of Israel slowly be preparing Planet Earth for the day of the future guela when All Israel will be redeemed? During this same period of time of four generations (160 years) be when the spirit of HaShem is making His last call for His people to come home, leave their apostate Christian roots and return to the land of their Promise? Amazingly this was the same era in which the Jewish people were radicalized to begin their future return to the land of Israel, when on February, 1840 in Damascus Syria, a Capuchin friar and his servant were killed. On that same day in the city of Damascus, something was burned in the hearts of Jews around the world. The “Damascus Affair” would become one of the most pivotal days in Jewish history. Immediately and abruptly after that event, the medieval blood libel was resurrected. The local Jews were charged with the murder of the friar so that the Jews could use his blood in the preparation of their Passover Seders. The Turkish Christian community was swift and brutal in their investigation. The Jewish males were rounded up and tortured until a Jewish barber, Solomon Negrin under torture confessed and named others, who confessed and named others and on and on and on. Sixty three Jewish children were “held as hostages until their mothers revealed the hiding-place of the blood.” (Paul Johnson, A History of the Jews, p. 322) The Jewish mind was never the same after that. Yet the 1840s were not just an eye-opener for the Jews of the ancient House of Judah. Over on the American and European continents the Lost Ten Tribes of the House of Israel were also experiencing a reawakening to their spiritual and literal reality. The American Israelites were living only 68 years after the Signing of the Declaration of Independence (1776), and 61 years after the end of American Revolution with Great Britain (1783). The European Israelites were still in a turmoil after the French Revolutionary War that was fought from 1792 to 1802 and the Napoleonic Wars that raged over Europe from 1803 to 1815. All of these geo-political events significantly affected American Lost Israelites and their European ancestors on the other side of the Atlantic on the continent of Europe. So also in the 1840s the Lost Ten Tribal descendants whose ancestors now included the northern ten countries of ancient Gaul in the European Union today, were now coming into a new awakening, called the Second Great Awakening, just as the Jewish people in Ottoman Empire at Damascus, Jerusalem and the Middle East were doing in 1840. The ancient Israelite descendants that rebelled 3,700 years ago, divorced their lives away from their Jewish brothers in Jerusalem, created the Northern Kingdom of Israel and later were sent into exile by the Assyrians, the ancient forefathers of the Syrians in Damascus in the region of Khurasan in Northern Iran, Eastern Afghanistan and Western Pakistan. They later migrated over and under the Black Sea towards Gaul in Northern Europe and as the ancient Celtic, Cymric people, plus the Scythians of the North who migrated to Scandinavia, and the Ostrogoths, Visigoths, and Vandals, spread across central Europe, Spain and Northern Africa. At the same time the Visigoths and the Vandals, ancient Lost Israelite tribes were the only peoples who defeated the invincible fortressed city of Rome; not once but twice. Yet, these Visigothic Israelites, later known as the Cathars, Huguenots and Waldensians also grew up under the spiritual control and oppression of the Roman Catholic Christian Inquisition against they and the Sephardic Jews in Spain during the Medieval Dark Ages. It was this same global religious system that corrupted the identity of a Jewish prince of David, called Yahshua HaNotzri (Jesus the Nazarene), yet now in the 1840s to the 1860s, the Lost Israelite adherents were beginning to perceive a new awakening and a new reality. The apostate Roman Christian Church had taken this Orthodox Jewish prince of David, who lived his life as a Haredi Ultra-Orthodox Jewish rabbi who kept the Torah above and beyond the letter of the Torah Halakhic Law had now been corrupted him into a Christian messiah that was anti-Torah, and anti-rabbinic Jewish. A Prince of David that was seen as the “messiah of his age” had now been morphed from his Jewish identity by divorcing his identity from his Jewish orthodox philosophical foundation. He was then transformed by the First Church of Rome into a Christian god recreated on a Roman-Greco religious philosophical base. One thousand eight hundred years later the descendants of these same Lost Ten Tribes of the House of Israel began to refocus their lives again upon a group of disciples of this same Jewish prince, Rabbi Yahshua, who were not Early Christians but Essene Nazarene Orthodox Jews. They began to research this Jewish prince and his true identity as a messiah of his generation. It was his message, the he was “sent” by a much higher authority in which he called “His Father in heaven” for one mission only; to find the “Lost Sheep of the House of Israel”. His talmidim (disciples) were also truly observant Jews who taught his message that the spiritual and literal intent of the Torah was to live out all the precepts of Torah Law; “ in “spirit and in truth”. By doing so, they could live a “life of Torah observance” that would transform them into a higher state of consciousness as a “son of G-d” or a “daughter of G-d”. There was one end-point that would occur at “time of the end” in which they called the “world to come”. Their lives would be transformed in preparation for the true reunion of Klal Yisrael (All Israel) when the Jews of the House of Judah and the Lost Ten Tribes of the House of Israel would be reunited again as one family worshipping in unity together the “His Father”; the One G-d of Israel. As one family, they would worship again at the end of the age in the restored Temple of HaShem in Jerusalem. Even in the final apocalypse of the 1st century BCE and CE as envisioned by the ultra-orthodox Jewish Essenes and Nazarenes, there was a prophetic book attributed to the Apostle John (Yohannes) called “The Revelation” where there are over 150 key phrases that are unique only to the “Sefer (Book) of Revelation” and the “Sefer of Enoch”. Is it not strange that this ancient sefer called the “Book of Enoch” was an ancient Jewish text of great sacredness to the Essenes? How do we know this? At the world renowned ancient Jewish site along the Dead Sea called Qumran, in the late 1940s, there were discovered in the surrounding caves of this reclusive retreat of the Essenes, more fragments of the Book of Enoch than any other of the sacred books of the Torah, Prophets, and Writings called the Old Testament today. It is today believed by many scholars that this Jewish prince’s older cousin by six months, John the Baptiser, was an Essene. Yahshua and his talmidim (disciples) were closely associated with these Haredi (Ultra-Orthodox) Jews located in Damascus, Qumran and villages like Nazareth scattered across the Province of Judea and Galilee and may have been a part of this far flung and widely scattered network of ultra-orthodox Jews from Egypt to Damascus who viewed the temple hierarchy of Herod’s Temple under the rule of the House of Ananias and his son-in-law, Caiphas in Jerusalem as apostates to true Jewish orthodoxy. Not only that , these same Essenes and Nazarenes were also closely associated with one of the Jews most famous “Davidian princes”, Rabbi Hillel the Great. He was the Nasi (President) of the Great Sanhedrin in the 1st century BCE and his Bet Av Din (Vice-President) of the Great Sanhedrin in Jerusalem was Menahem the Essene. Now seventeen centuries later, in the late 18th century, the disciples of the famed Jewish rabbi called the Vilna Gaon were now heading to Israel in a great migration to inhabit the Land of Israel in preparation for the coming of the Jewish messiah called the Maschiach ben Dovid; the Messiah son of David. At the same time, the descendants of the Lost Ten Tribes of Israel who were now inhabiting the Eastern Seaboard of the United States of America, were now participating in the “First Great Awakening” and racing up and down the newly birthed 13 Original Colonies representing the 13 Tribes of Israel that included two tribes for Joseph’s two sons, Ephraim and Manasseh. Let us not forget that the Hebrew language was virtually a dead language in the early 19th century. In 1840 there were only 15,000 Jews in the United States. What about Jerusalem? This city of such fame and legendary importance in the ancient world was but a desert wasteland with a trash heap of ancient ruins and a Moslem mosque that was a forgotten derelict mosque by the disrespect of the Islamic Arabs and left there in forgotten disrepair. In the year 1840, the year of the “Damascus Affair”, there were only about 5,000 Jews in Jerusalem. This was a huge population because the British were making great efforts to import Jewish people into the land over the prior 12 years when there were only 550 Jews living in the city. And yet, the early Millerites, named after William Miller, had the audacity to roam the American border states along the eastern coast of the United States, (that is all that there was of early United States of America) in a wave of religious fervor and preach the message that a Jewish messiah was coming, and coming literally as a human being. Every eye would see him and he would bring to this world a new age of the messiah. Redemption to them was to be a physical event. This was in direct opposition to the Roman Christian world where the New Jerusalem was Rome and the Roman Christian messiah was already here spiritually imbedded in their hearts. This literal coming to the Millerites then was what the Jews today call “redemption by bi’etah”; that is associated with great apocalyptic catastrophes and devastations. Yet the biblical and prophetic picture of the end times that has been left by the ancient Jewish and Israelite prophets is that there will be an era of great catastrophes in the future that will reshape and remold the thinking of the Lost Ten Tribes of the House of Israel. It will prepare them and the Land of Israel, their ancient homeland for the future age of the Jewish messiah. Obadiah 15-21 – “For the day of HaShem upon all the nations is close; as you have done, [so] shall be done to you; your requital and shall return upon your head. For just as you drank on My holy mountain, so will all the nations drink ceaselessly; they will drink and be confounded, and become as if they never were. On Mount Zion there will be refuse (Al Aqsa Mosque), and it will be holy; and the house of Jacob will inherit those who had dispossessed them. The house of Jacob will be fire, the house of Joseph a flame, and the house of Esau for straw; and they will ignite them and devour them. There will be no survivor to the house of Esau, for HaShem has spoken. And [those of] the southland will inherit the Mountain of Esau; and [those of] the lowland [will inherit] the Philistines, and they will inherit the fields of Ephraim and the fields of Samaria; and Benjamin [will inherit] Gilead. Announce this among the nations; prepare for war; arouse the mighty men; let all the men of war approach and ascend. Beat your plows into swords and your pruning forks into spears; even the weak one will say, ‘I am mighty.’ Let all the surrounding nations hurry and come, and let them gather together; there HaShem will demolish your warriors…Multitudes upon multitudes [will fall] in the Valley of the [Final] Decision, for the day of HaShem is near in the Valley of the [Final] Decision. The sun and moon have become blackened, and the stars have withdrawn their shine. And HaShem will roar from Zion and will emit His voice from Jerusalem; and the heavens and earth will tremble. But HaShem will be a shelter for His people and a stronghold for the Children of Israel (Lost Ten Tribes of the House of Israel). Thus you will know that I am Hashem your G-d, Who dwells in Zion, My holy mountain; Jerusalem will be holy, and aliens will no longer pass through her. Zechariah 10:6- (parts) “I will give power to the House of Judah and I will save the House of Joseph (Lost Ten Tribes of the House of Israel); I will settle them for I will have mercy upon them, and they will be as if I had not rejected them; for I am HaShem their G-d , and I will answer them. Ephraim will be like a mighty warrior and their heart will be glad as [with] wine. Their children will see then be glad; their heart will rejoice in HaShem. I will whistle to them and gather them, for I have redeemed them; and they will become as numerous as they had been numerous. I had sown them among the nations, and they remembered Me in faraway places; so they will live, and their children, and they will return. As the cataclysms continue to mount, and the foundations of the earth shake and rumble; the Straits of Gibraltar is expected to begin to widen. The Mediterranean Sea will again become transformed. Where it once was a river valley called the River Styx, it later widened into the Mediterranean Sea in times of great cataclysm. Today in the basin of where the River of Styx once ran, undersea archeologists have found upwards to 300 megalithic sites where cities once existed; down under the depths of the sea. So now it appears that the Mediterranean Sea will be stretched as the Atlantic Ocean along the Atlantic ridge begins to rapidly expand. Once again the Mediterranean Sea may become an ocean inlet jutting in towards Jerusalem. Today, the stresses upon the rift zone at the Dead Sea is the same region that Abraham observed a fiery cosmic hailstorm of sulphur ripping chasm in the earth at the beautiful verdune garden district called over the ages the Vale of Siddim, the Sea of Arabah, the Salt Sea, the East Sea, the Sea of Lut, Lake Asphaltitus and today the Dead Sea. This is where Abraham’s nephew chose to live near Sodom and Gomorrah when it was destroyed in an inferno of sulfurous hailstones. The catastrophe then ripped through the Jordan River Valley, down the Red Sea and into central and southern Africa. Today it is called the Great Rift Valley. So also, this region will again become reshaped as the G-d of Israel will recreate a new Gan Eden. The 3,000 sinkholes along the Dead Sea are only a foretaste of what is about to happen as the entire Land of Israel will becomes transformed into the future Garden of Eden where the Jewish messiah, the son of David will come to rule with his own people; the Jews and the Lost Ten Tribes of the House of Israel. Today the Dead Sea is creating one new sinkhole a day. This is compared to the first sinkhole in the 1980’s and just 40 sinkholes in 1990. Modern scientists can only envision the sinkhole origins as coming from the drying up of the water aquifers beneath the Dead Sea. They claim that this due to the discriminate number of wells that are being dug into the regions of Jordan, the Palestinian towns and villages in Samaria and up along the entire Jordan River Valley towards Syria and beyond. The Dead Sea is about 60 miles long with Jordan to the east and ancient Samaria and Judea to its west. Over the past 50 years since the 1960s, the water level of the Dead Sea has dropped 33%, from about 950 square kilometers then to 637 kilometer today. This rapid pace appears to also be accelerating at between a drop in the sea level of the Dead Sea for 0.8 meters to 1.2 meters per year. But the G-d of Israel has other plans. It is the lack of faith of these scientists who can only see in the short perspective and not believing the prophets of old that is keeping them in dismay. The failed visions of “human created global warming” have now been discovered as a fraud by the rising human consciousness. They are rapidly disbelieving anything that comes from the pens of those who think that they are a global authority. At the same time, the prophetic picture gives us another visage as a prophetic vision in our near future. So what should we expect. The prophetic picture is clear. There will be continuous plate movements in the Middle East. It will eventually torque the entire Arabian Plate is such a manner that the top region of the Arabian Tectonic Plate will produced massive movements directly north through the oil fields of Iraq. If so, the finger of G-d will reigniting the same region into hundreds of burning infernos just like Saddam Hussein did when the Iraqi military set fires to the oil fields of Kuwait prior to the 1991 Gulf War. It was the Prophet Ezekiel that was introduced to a man who fit all the ancient pictures of angels, “whose appearance was like that of copper, with a linen cord and a measuring rod in his hand; he was standing by the gate” and what did Ezekiel see? He measured…a stream that I could not cross, for the water had swollen into water for swimming, a stream that could not be crossed!...Upon my return, behold, along the bank of the stream were very many trees on one side and on the other. He said to me, ‘these waters go out to the eastern region; they descend to the Arabah and to the Sea (Dead Sea), to the spreading sea (that is today creating thousands of sinkholes), and the water will become sweetened. ‘And it will be that any living thing that will swarm, wherever these streams flow, will live, and the fish will be exceedingly abundant; for these waters will come there and they will become sweetened, so that [the fish] may live, wherefore the stream comes. It will happen that fisherman will stand by it, from En-gedi to En-eglaim; they will be spreading places for nets. “Their fish will be also of many species as the fish of the Great Sea (Mediterranean Sea), exceedingly abundant. But its swamps and pools (the sinkholes along the Dead Sea) will not become sweetened; they will be set aside to provide salt. What a magnificent picture of the “World to Come!” Christian expositors over the centuries have speculated that this Garden of Eden will be on some other planet, star system or galaxy, but the rabbis of Judah have faithfully kept to the literal foundations of the prophetic interpretations for in that day, the Messiah of Israel will be sent down to live and rule with his people. In that day also the Dead Sea will become again a living sea, from waters that will come not from a reclamation canal built by the Jews from the Mediterranean to the Dead Sea but by the restoration of the ancient Gihon River erupting from the foundations of the new Temple built upon the restored Temple Mount region. It will host fish in great abundance and trees with edible bark and leaves that will be for the healing of the nations. If you need two prophetic witnesses for such a vision of our near future, then let us listen to the words of the Prophet Zechariah. Zechariah 14:1-11 – “Behold, a day is coming for HaShem, when your spoils will be divided up in your midst. I will gather all the nations to Jerusalem for the war; the city will be captured, the houses will be pillaged and the women will be violated; half of the city (Eastern Jerusalem) will go out into exile, but the rest of the people will not be eliminated from the city (Western Jerusalem). HaShem will go out and wage war with those nations, as He waged war on the day of battle. His feet will stand on that day on the Mount of Olives, which faces Jerusalem on the east, and the Mount of Olives will split open at its middle, east to west. [forming] a very wide valley; half of the mountain will move to the north and half of it to the south. And you will flee to the valley of the mountain, for the valley of the mountains will reach to Azal, and you will flee as you fled from the earthquake that was in the days of Uzziah, king of Judah. And HaShem, My G-d will come; all of His Holy Ones (angelic hosts) will be with you. It will be on that day that light will not be either very bright or very dim. It will be a unique day; it will be known as HaShem’s [day] , neither day nor night, but it will happen towards evening time that there will be light (where the sun goes down, it will rise the next day). It shall be on that day, spring water will flow out of Jerusalem; half it [will flow] to the Eastern Sea (Dead Sea) and half of it to the Western Sea (Mediterranean). This will be in summer and in winter. Hashem will be the King over all the land; on that day HaShem will be One and His Name will be One. An aerial view shows a close up of a salt formation inside a large sinkhole on the shores of the Dead Sea. Mishnah 12 of the Emek HaMalekh – “Hiluk, son of Shimur HaLevi, was given twelve more precious stones in order to hide them so that they could [eventually] be restored to the Tribes [of Israel]. The names of the Tribes were engraved on them, and they shone on the Tribe's heads, excellent and precious, one more than the other. No king, prophet, or anyone else knew where they were hidden, excepting Hiluk, son of Shimur HaLevi. The remainder of the wealth and glory that was in Jerusalem was taken by angel Shimshiel. Shimur, Hiluk, and their companions, the Levites, later went and showed it to Michael and Gavriel. We know that the relationship of Baruch was indelibly sealed with the voice of Jeremiah for Baruch was the prophet’s amanuensis, the literary or artistic assistant of the prophet who took his dictations and inscribed them on manuscripts or copies to kept in a literary archive. Yet, Baruch was more than just a scribe. He had a profound a secret mission that he and several others had conducted probably unknowing to the last royal ruler of the throne of King David, King Zedekiah. Baruch the scribe, years earlier before the destruction of Solomon’s Temple, was one of the priestly commandos who in a daring mission under the direction of Jeremiah the Prophet and under the royal command of King Josiah hid all the sacred treasures of King Solomon’s Temple. This is true and the actual living legend was hidden in a secret Tosefta, an addition to the Talmud, which was preserved not in but separate from the Hebrew Talmud. It was in 1992 that Rabbi Rachnael Steinberg with his student Rabbi Mendel Tropper discovered in Amsterdam, Holland the long lost writings called the “Emeq HaMelekh”, meaning the “Valley of the Kings.” It had been written by Rabbi Naftali Hertz Ben Ya’acov Elchanon in the year 1648 in Amsterdam. According to rabbinic history, “Rav Hertz” was known as a prominent and holy Rabbi who excelled in the knowledge of the written and the oral Torah. His lineage of rabbinic knowledge came from the famed Rabbi Ari Ben Luria, leader of the rabbinic mystical sages which included the great Torah sage, Rabbi Yosef Cairo, author of the Shulchan Aruch. According to the records, Rabbi Naftali Hertz cited as his source as the Massakhet Keilim, a Tosefta (addition) to the Talmud, which is not found in any modern Talmud today. As recorded in the BibleSearchers research on the Emeq HaMelekh, in the series of articles titled, “The Emeq HaMelekh (Valley of the Kings)”, the Hebrew Account of Hiding the Ark, the Sanctuary and the Treasures of Solomon’s Temple” See Parts (1), (2), (3), (4), (5), (6), (7), (8), (9), (10), (11), (12); we can today read the amazing story as preserved by the famous “ark and Mishkhan hunter”, the late Vendyl Jones who was blessed by Rabbi Menachem Schneerson as a “Righteous Gentile”. BibleSearchers Reflections – “According to the discoverer of the Emeq HaMelekh, Rabbi Steinberg, in the Talmud Huriot 12A, describes the prophet Jeremiah, realizing that the destruction of Jerusalem and the Temple was imminent, organized a heroic rescue operation. He was commanded by the King of Judah, King Josiah, who had recently repaired the Temple of Solomon and found the ancient writings of the Torah hidden in the Temple, to hide the Ark of the Covenant, the bottle of Anointing Oil, Aaron’s Staff and the ‘Chest’ sent by the Pelishtim (Philistines) to Israel as “a gift to the God of Israel”. Rabbi Tropper – “This house of worship (“Mishkhan”) contained the altar for the daily and seasonal sacrifices, the elaborate Menorah (candelabra) of solid gold, the Qalal (copper urn) containing the Ashes of the Red Heifer, and the numerous other vessels utilized for the detailed services of the Kohanim (priests). Within the Mishkhan's inner chamber, the Holy of Holies could be found the magnificent Ark of the Covenant containing among other sacred items, the Tablets of the Ten Commandments brought down by Moses at Sinai. Because of these sacred contents and the level of holiness attained by the Prophet Moses, only the Mishkhan reached a pure enough state to warrant that the Shechina (Divine Presence of G-d) would come to rest within it for all eternity. When the First Temple was built in Jerusalem, the Ark of the Covenant was placed inside while the rest of the Mishkhan was buried beneath in a secret vault." The story does not end. Later in the 1990’s, at Cambridge University was discovered work done by a Solomon Schechter in 1896, who had bought about 100,000 pages that had been discovered in a Genizah of the ancient and revered Ben Ezra Synagogue in Cairo, Egypt. According to the Torah, any document contained the name of the Holy One could not be destroyed, so when it was damaged or too old to be used, it was put in a document depository called a Genizah. The documents within the caves of Qumran were also suggested as being a Genizah depository for the Essenes or for the priests in Herod’s Temple in Jerusalem. The reason being that Qumran was suggested as being a Genizah is that every book in the Torah, the Writings and the Prophets, plus countless other inter-testament writings and commentaries were represented in the Qumran library except for the Book of Esther; the only book written by or about the Jews that does not give the holy name of HaShem, the G-d of Israel. Within the scrolls found in the Ben Ezra Synagogue’s Genizah in Cairo, Egypt was found a copy of the missing Tosefta, listed under the section of Keilim (‘Vessels’) and noted to be the same source writings that Rabbi Hertz was citing in his 1648 Mishnayots. The only difference, these source writings were believed to be from the 8th and 9th century; 800 years earlier. The 9th Mishnayot of the Emeq HaMelekh - “David [also] made 1,000 lyres and 7,000 harps to atone for Israel. He had Zilzalim (cymbals) for singing, extolling, thanksgiving, and praising the G-d of Israel which were handed down to him from Moses, from Sinai. The words, “From beneath the legs of the Throne of Glory, sapphire stone, in the likeness of the Throne” (cf. Exodus 24:10), were inscribed upon them. The lyres were made of Almugim wood, overlaid with fine gold, with 8 stones on each lyre, carried by the clouds, the demons and the spirits that were under Shlomo's dominion. On each lyre was a bell of "Nehoshet Kalal" (burnished copper) from before the Throne of Glory, together with a priceless, precious stone that Moses quarried on Mount Sinai from under the Throne of Glory which was upon the Sapphire Stone. All these were hidden and concealed in "Ein Zidkiyah" that the fittest [men] of Israel knew in secret, lest they fall, G-d forbid, into the hands of the enemy who hated Israel. For these vessels are not to be used except to atone for Israel. Baruch [ben Neriah] and Zidkiyahu thus concealed them to prevent the Chaldeans from using them, G-d forbid. On October 21, 2013, it was reported in Israeli News that four minor earthquakes his northern Israel near the Sea of Galilee. They include a seismic shutter of 3.6 at Lake Kinneret. Two days later a second of 3.0 magnitude, and on the heels of those two more earthquakes measuring 3.6 within hours of each other. For decades the seismic experts in Israel have been expecting that a large earthquake will strike. The history of the King David comes out of the loins of the Jewish people. If anyone should know their history, it should be them. Not only that, King David was a proto-type of the future Messiah and his life was a dramatic rehearsal of the Messiah who would later come and bring the “Drama of the Ages” to its fullest realization. The Israelite people arrived on the scene of history out of one of the greatest planetary apocalyptic eras of catastrophes of bolides of fire, great plagues, and a global apocalypse. They became a “nation of twelve tribal peoples” at the mount called Sinai and there the Children of Israel were called by G-d; “The Nation of Israel”. Today, we recognize them only by the visible portion as the Jewish people. Three thousand and five hundred years later, the Jews erupted out of the ashes of a holocaust that almost eliminated them from the face of the earth, and created also in one day, a “Nation of Israel”. There are no peoples who have arrived in the modern age from the mists of history with their history, language, cultural identity, streams of prophecies that were given hundreds and thousands of years before they arrived, except the Jewish people. They also gave us their G-d who claimed He birthed them, nurtured them, and will preserve them for Eternity. Yet, we believe that the rest of the Ten Tribes of Israel are still “lost”? If you want to learn more, Contact “Kol Ha Tor Vision”, the Voice of the Turtledove. Here is a joint Orthodox Jewish and 10-Triber Vision to bring awareness of the imminent fulfillment of the Biblical Prophecies regarding the Redemption of all Israel (12 Tribes Re-conciled and Re-United). The author of this blog is a supporter of Kol Ha Tor Vision and while we are publishing material that may be relevant to the Lost Ten Tribes of the House of Israel, the leadership of Kol Ha Tor do not necessarily agree with everything we have published. Yet, we understand, until the Messiah son of David comes to give us full insight into what is happening to our lives and our world today, we may know only in part while we continue to support the rabbanim of Israel and seek reconciliation with the Jews of the House of Israel until we are finally one family; the family of our Patriarchs Abraham, Isaac, and Jacob. For inquiries about Kol Ha Tor Vision for the Lost Tribes of Israel, we invite you to make a personal Visit to Israel and stay at “Shomron Lives!”, a Spiritual Retreat and Guest House in Samaria, that hosts Shomron (Samaria) Tours to reacquaint the Returning Lost Tribers of the House of Israel.